Imagine craving a lasagna but in the form of meat & potatoes… Imagine having a good ol’ Shepherd’s Pie but wishing it had the Latin-Caribbean flavors that you grew up with. Now imagine just wanting a decadent meat and potatoes dish with awesome sauce and plenty of cheese. Drooling yet? 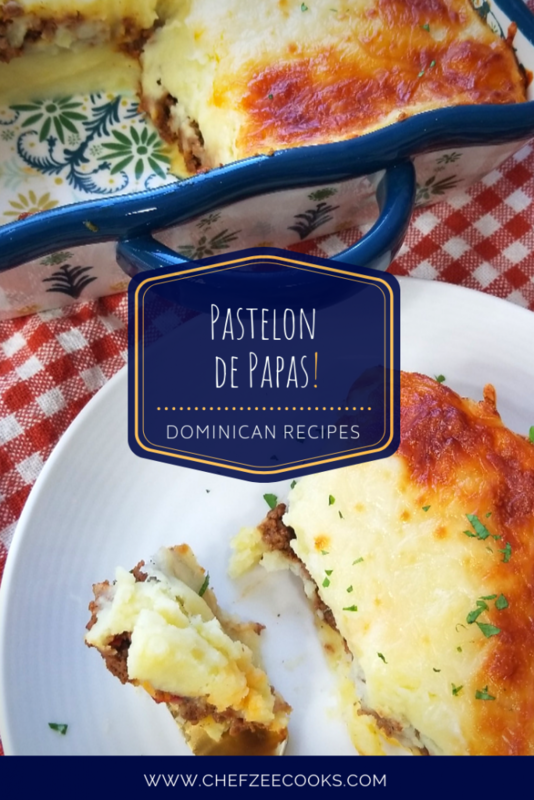 Today, I introduce you to Pastelon de Papas which is essentially a Dominican Version of Shepherd’s Pie. It’s the very essence of comfort food since it combines all of the fan favorites– meat and potatoes. As a child, I never realized just how difficult it must’ve been for my grandmother to assimilate into an entirely different culture after having lived a whole life. Unlike my mom who came to this country at 18, my grandmother was full grown adult who had raised several kids, siblings, nephews, and even grandkids. I remember getting mad when she refused to cook some the dishes that I had only heard about– like macaroni and cheese. Overtime, I grew to appreciate more than life itself. It’s because of her that I honor tradition and it’s also why I’m still so tied to my roots. As a first generation American, it’s easy to shed your roots and fully adopt your new home– because it is home. I was born and raised in Queens, NY and a New York Slice is very much part of my DNA as is Mangu & Ropa Vieja. I never realized that my grandmother made Pastelon de Papas as way to relate to younger generation. Outside of soup, Dominicans don’t really eat potatoes. We have so many other starches in our diet, that potatoes are low on totem pole of starches that we choose to eat. When we do eat it, we’re either whipping up a mean mashed potato or having our own version of shepherd’s pie. Once you start cooking the ground beef, it will become chewy. Using the back of a wooden spoon, gently mash down the ground beef making sure to break up the clumps. Continue to add water and letting it evaporate until the beef reaches your desired texture. We’re essentially stewing the ground beef so that we end up with a silky smooth melt-in-your-mouth carne molida. If you prefer a more chewy and gamey carne molida, stew for less time. Now that we’ve covered the Carne Molida Basis for this dish, the other major component we must tackle is the mashed potato. Warning: You will have to resist the urge of eating all of the mashed potatoes when making this dish! It’s so easy to get carried away that in end you may not have enough mashed potatoes to actually assemble the dish…. I’ve been there. You can use whichever mashed potato recipe you like! I suggest keeping it simple since the ground beef will already be loaded with flavor. I also suggest using golden potatoes since they’re super buttery and naturally creamy. However, Idaho potatoes will also. Last but not least, don’t be cheap with the cheese! You can use cheddar or mozzarella cheese or you could even go half and half. The choice is up to you. Me personally, I’m a mozzarella cheese kind of girl. I blame my Italian Step-Dad. In a large deep sided skillet, warm over medium heat and add olive oil. Once hot, add meat making sure to brown evenly on all side. Using the back of a wooden spoon, press down on meat being sure to break apart any clumps of meat. Once the meat is fully browned, add 4 cups of water and let meat simmer until water evaporates. Taste meat and add more water if meat is still chewy. Also, be sure to remove any excess oil. Once ground beef has reached desired soft buttery texture, add tomato paste and olive. Mix together until well combined. Afterwards, turn off ground beef and set aside. While meat is cooking, boil water with salt and add diced golden potatoes. The smaller you cut the potatoes, the faster that will be ready to mashed. Once potatoes are soft, drain water and then add warm milk, butter, salt to taste, and black pepper. Mash together until velvety smooth. 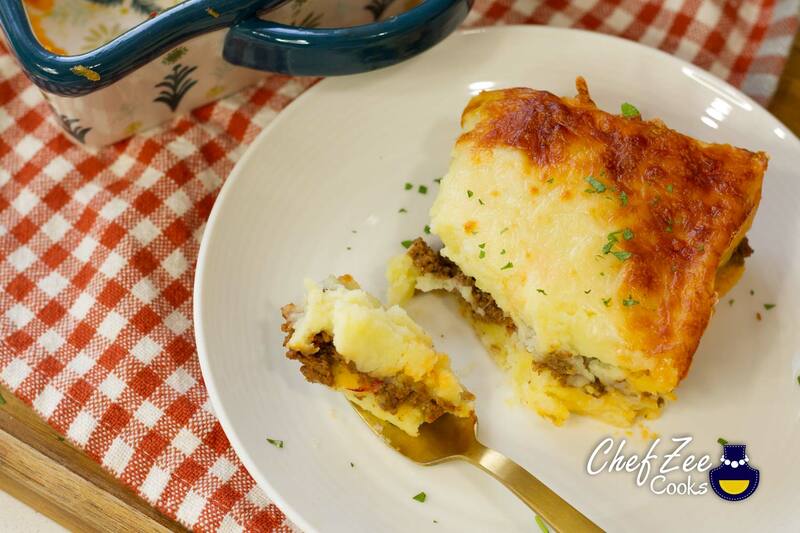 In a 8×8 deep oven dish or shallow 9×13 baking dish, begin building Pastelon. First lay down even layer of mashed potatoes. Next, add even but thick layer of ground beef. Generously add mozzarella cheese. Now add top layer of mashed potatoes. In the end, add mozzarella cheese over top. Overall, you want to have two layers of mashed potatoes– one on the bottom and one on the top with the ground beef in the middle.